It was personal experience that brought Telluride local Scott Nuechterlein to enter entrepreneurship three years ago, with his brainchild Telluride Delivers. 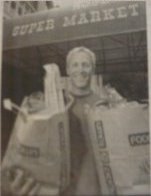 "From my experiences at markets here, a routine grocery shopping trip can take hours to accomplish," said Nuechterlein. "Then I thought of all those people wasting all that time in the grocery store when they could be off enjoying themselves. We were living at Eider Creek (about 4 miles out of town) at the time and on many occasions thought it would be nice if there was a service that would deliver." A Telluride resident since 1997, Nuechterlein has worked with several local service-related businesses and restaurants, and became associated with lodging establishments which often voiced the needs of guests visiting on business and pleasure. Nuechterlein has studied Business and Hotel & Restaurant Management. "The first thing people want to do is get on with their vacation and not have to deal with the basic things," said Nuechterlein. "We cater to people's needs, they are our main priority." Telluride Delivers' services are available daily, weekly and monthly to visitors, second home owners, and residents of Telluride, Mountain Village, and the surrounding area. Nuechterlein does not exclude local desires - Telluride Delivers will make those Montrose trips and more that residents may not have time for. A substancial discount is given for locals and Telluride Delivers operates through the off-season. For more information on Telluride Delivers, call 970-729-3223, or visit its Web site at www.telluridedelivers.com. flowers, prescriptions, take-out and airport baggage delivery, Telluride Delivers covers it all, including the unusual - during the holiday season they will deliver, set up, and decorate Christmas trees. Telluride Delivers reaches for Telluride's visitor clientele, helping them make the most of their vacation time by taking care of the details. The business premise is based on two facts, said Nuechterlein: hundreds of visitors arrive on the same day in Telluride and Mountain Village during festivals and the ski season, and typically a visitor will spend an average of 2.5 hours grocery shopping, assuming he or she rented a car.